Located across the spectacular San Diego-Coronado Bridge from downtown San Diego, Coronado Village is surrounded by the San Diego Bay on one side and the Pacific Ocean on the other. 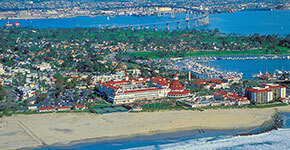 Also known as 'Coronado Island', The Village has a quaint small town feel combined with sophisticated luxury living and is known for it's top ranking Coronado Beach, world-class resorts and desirable year-round mild Mediterranean climate. Coronado Village in Coronado, CA is rich in history, natural beauty and offers a charming ocean village atmosphere while providing a high quality of residential lifestyle including thriving business center, diverse local amenities and a highly revered school system. In the heart of the Village, Orange Avenue offers great local shopping, boutiques, coffee shops and fine restaurants while the Coronado Ferry Landing in the Bay Front area has a charming collection of market shops, galleries, eateries and some of the best views of downtown San Diego! Local Coronado residents and tourists agree that The Village offers the best possible combination of relaxed seaside village living with the convenience of nearby city amenities. Explore the quiet tree lined street and friendly neighbourhoods of the Village and you will discover a ecletic collection of architectural home styles from Victorian cottages and Spanish villas to modern mansions. If you are looking for additional housing options, the Village also offers everything from charming craftsman townhomes in the heart of the Village to larger multi-level condo building complexes. Whether you are searching for a charming 1 bedroom starter condo in the heart of the Village or an exclusive ocean-front estate vacation property, the Village has everything you need to make it your new home!